Portable PA systems ensure that every speaker and teacher can reach all participants without straining their voices. Where can you get a portable PA system? Hertz Furniture has a number of options with different amplification capabilities to ensure that your messages will be heard loud and clear. Guest speakers are sure to appreciate how easy it is to reach audiences with a personal PA system. This small piece of equipment ensures that even the people in the back row will hear the presentation. With Hertz Furniture&apos;s selection of portable speaker systems, any room can have the acoustic quality of an auditorium. How can I ensure that everyone in the auditorium hears clearly? Nothing is more frustrating than arriving late at a much-anticipated event and having to sit in the back of the room. Straining to hear the words of the valedictorian or guest lecturer can put anyone in a sour mood. With the right portable sound system, you can ensure that every attendee and audience member can hear the event proceedings clearly, no matter where they are seated in the auditorium. How do I choose a mobile PA system? While the ideal is to have a PA system that can reach the maximum number of people, budgetary concerns are often a factor that goes into determining what to purchase. If you only need amplification that can reach a small crowd in a concentrated space, there is no need to invest in a PA system that is more powerful than you need. However, for those who have room in their budgets to invest in a more powerful portable speaker system, it will be helpful to have the capability to reach much larger crowds, in the event that the need should arise. How powerful is a PA system? 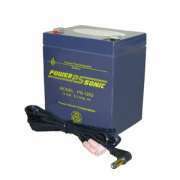 For a more powerful option, consider a 20 watt PA system. This option lets you reach twice as many people and includes a tie-clip microphone and tape recorder as well. This arrangement is ideal for teachers because a lapel microphone facilitates hands-free use so the PA system won&apos;t get in the way of writing on the board or handing out papers. The tape recorder is useful because it enables educators to record lectures for absent students or self-evaluation purposes. How many people can I reach with a portable PA system? When you need to reach huge crowds but don&apos;t have advanced audio equipment in your auditorium, sanctuary or social hall, a powerful mobile PA system can get the job done. Rather than investing thousands of dollars in a built-in system, you can get what you need in a portable package, at a budget-friendly price. 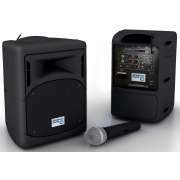 With the 100 watt personal PA system from OSC, you can reach crowds of up to 10,000 people. 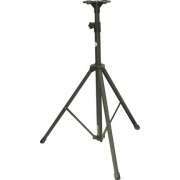 Just use the handheld wireless microphone to transform any room, large or small into an amplified hall. Speakers, actors, performers and presenters will enjoy the flexibility to roam within 200 feet of the system as they walk out into the audience, move around the stage and take advantage of the freedom to express themselves in an open space. In addition to having a microphone and speaker, this all-inclusive system also comes with a CD player, cassette player, ipod dock and USB port, so you can include sound effects and musical accompaniment as well. What kind of microphone do I need for a PA system? There are a number of microphone styles to choose from when using a PA system. The most basic handheld microphone provides satisfactory sound, but it can become a nuisance to the speaker. It can be challenging to operate a slideshow or even speak from notecards when one&apos;s hands are occupied by a mic. For a hands-free solution, try a headset microphone or lapel microphone. Headsets are convenient for people who will not be seen by the audience, while subtle clip-on models can be used by speakers, actors and singers without becoming a distraction to anyone. For the best in sound quality and portable amplification, look no further than Hertz Furniture&apos;s portable PA systems. Our equipment is designed for the convenience of both speakers and audiences. If you need help choosing the optimal wireless sound system, contact the Hertz Project Solutions team for free project-planning advice.